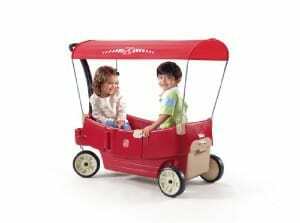 The red pull-along, ride-in wagon has become synonymous with the joys of childhood. This isn’t surprising as children like to be pulled along by their family members and friends while riding on these wagons, as well as pulling along their precious possessions. The wagon is such a staple of childhood that parents and grandparents today have fond memories of it. Of course, the physical and mental benefits that come from playing with these wagons cannot be dismissed either. Child psychologists agree that the proper and regular use of wagons among children strengthens their muscular, social and cognitive skills, especially during cooperative play. Parents agree that just seeing their children enjoy their wagons is sufficient reward for the time and money spent on buying these toys. Here are our top 12 picks for the best kids’ wagons. Choose based on your budget, as well as your kid’s age, weight and preferences to get the best bang for your buck. The Step2 brand is known for the versatility of its products in the sense that they “grow” with your kids and/or have multiple uses. This is true for this All Around wagon, which has two main uses: first, as a pull-along wagon with and without a canopy; and second, as a flatbed or table for your little ones to enjoy. 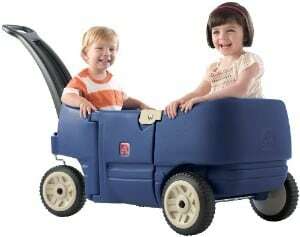 As a pull-along wagon, it has comfortable seats for your kids to sit on while being pulled along. They can be installed or removed depending on their preference. As a flatbed or table, the seats can be flipped over to transform into a larger flat surface. Your toddler can then use it for their daytime naps or activities. What's Great About It: We must say that this wagon gives great value for the money because of its versatile uses. Just add a mattress and it becomes a flatbed. 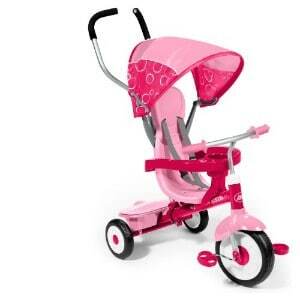 We also like its smooth and silent wheels, a must when you have kids using it several times a day. We wish that its 75-pound weight limit could be increased, but for everything you get, this is a minor issue. Manufacturers are very aware of the versatility trend in wagons. The Little Tikes’ Deluxe wagon is a ride-on wagon for kids that can also be converted into a picnic bench in just a few easy steps. Just remove one of the sides to transform it from a wagon to a bench. As a bench, it has a 250-pound weight limit, so even an adult can sit beside their child without fear of the bench falling apart at its seams, so to speak. This weight limit is unique to this bench, and you will be hard-pressed to find one with a similar limit. Since it’s a picnic bench, it also has features suitable for outdoor picnics. There is the large umbrella for shielding against sun and rain, as well as a cooler for keeping several snack items cold. What's Great About It: We like the versatility of this product. Your kids can have a ride-on toy that they can use when playing, and it’s a great toy for psychomotor development too. You can then convert it into a picnic bench when your kids want a place to sit and enjoy their afternoon snacks. There are times when a classic design is perfect as it is – or at least, with a few revisions to accommodate the modern lifestyle. The Canopy Wagon may have a classic design since it isn’t a convertible model, but its simplicity is the ace up its sleeve. As a parent, you have the assurance that your kids can easily pull the wagon, thanks to its durable yet lightweight molded plastic frame. The wagon can accommodate two kids with a weight limit of up to 75 pounds, while the removable, sturdy canopy shields them from the elements. The seats have comfortable contours, while the storage space underneath and cup holders can keep a few small toys, snacks and drinks. What's Great About It: We like that it has a classic design that evokes the beloved red wagon of our childhood. The simplicity of its design also means that it’s a kid-friendly wagon while the wide canopy, contoured seats, and storage space make them happy. We also want to emphasize the small compartment for keeping various items such as keys and smartphones, a convenient feature for the adults who pull the wagon. 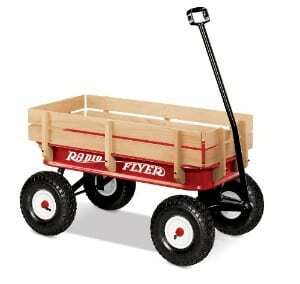 The Radio Flyer brand of wagons is undoubtedly the most beloved of them all because it made famous the red wagon. Aside from the ubiquitous Radio Flyer logo, this steel-and-wood wagon easily attracts attention because of its sheer size. Your kids will love that it can be used for most types of terrain from asphalt surfaces to gravel roads, thanks to its large 10-inch inflatable tires. The tires ensure both a comfortable ride and optimum stability. 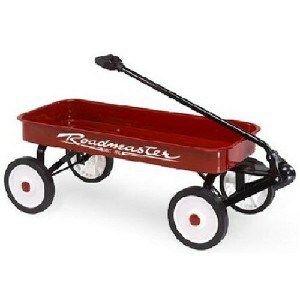 You may even be nostalgic for your own Radio Flyer from your childhood days when you see it. This one has a body and frame made from high-grade seamless steel and natural wood, the same combination from your younger days. The combination also ensures the wagon’s durability even when two kids are in it, especially considering its 200 pound weight limit. What's Great About It: We recommend this wagon because of its classic design albeit in a larger size suitable for heavier children. You can even use it as a trolley for pulling things along, but be sure to keep within the weight limit. You can also remove the wooden sides so that mom or dad can also ride in it. Yet another classic wagon designed for contemporary use, the Wagon for Two is just what it sounds like. Your older kids can easily pull their younger siblings along in the wagon, thanks to the lightweight material and sturdy wheels. You can also easily clean the wagon by hosing it down – the drain holes on the floor will prevent water from pooling inside it. Like most of the wagons here, you can also use the storage compartments for keeping small toys and supplies inside. The seatbelts keep your smaller kids in their seats, a safety feature we love. The cup holder is also nifty for keeping your children's drinks in close reach. What's Great About It: We recommend this wagon for toddlers because of its simple design, sturdy frame, and large wheels. Your kids can use it in different situations too, such as on the beach, in the park, and around the neighborhood. 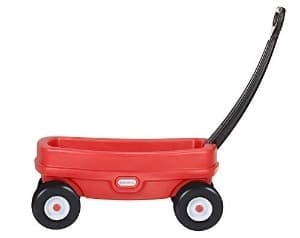 This is a great wagon for teaching toddlers about the joys of pulling on and riding in a wagon of their own. Step2 has taken the classic wagon to new levels of versatility with its Whisper Ride Touring Wagon. You will find several uses for it so that you don’t have to bring along other mobile pieces of kids furniture along. As it is, it’s a classic wagon that kids can either ride in to be pulled by another or pull while other people or toys are in it. It can also be used as a dining table for kids when its table surface is installed, which is a handy feature during picnics. When the table panel is laid across the leg well, the wagon becomes a daytime bed. Just place a comfortable mattress or a thick blanket on its surface and voila - the perfect sleeping spot for your little one. You can remove the table panel and store it in its secret compartment. Follow by removing the high side walls from the wagon to make a complete flatbed trailer. Your kids can transport several items in the trailer, but we suggest sticking to the 100 pound weight limit. What's Great About It: We do wish that the wheels could be larger and wider, but it’s a minor issue. This wagon has so many things going for it, especially its multiple uses, that we can overlook the wheels. Your kids will feel like the master of the road with the Pacific Cycle Steel. The wagon may not be as versatile in uses as the others here, but there are plenty of great things about it. You will like its classic design updated for modern standards. The large 8-inch rubber wheels and high ground clearance allows its use on both smooth and rough terrain, including gravel roads. Just be sure to instruct your kids about keeping away from dangerous roads and areas. The 34 inch seamless steel bed and steel handle means that it can carry up to 250 pounds in weight. Of course, your child cannot pull along 250 pounds in weight, but it’s great to know that the wagon’s as sturdy as can be. Other safety features include rolled edges of the bed, a no-pinch handle, and a no-pinch pivot. What's Great About It: We like its simple yet practical design coupled with its sturdy frame and safety measures. You can even use it for carrying several items, such as moving things from your shed to your garage. It's also a great way to get your kids involved in household chores. Yet another Radio Flyer product makes its way to our list, although this isn’t a wagon in the full sense. As its name implies, this is a walker suitable for children aged 1 year old and above who want to learn to walk and run. This isn’t just an ordinary classic walker of old either because it has great safety features. You can rest easy in the knowledge that its 13 pound weight can easily be pushed by your little one. But it’s not so easy to push that it will endanger your child, especially on slippery surfaces, because of its resist-push technology. The safety features also include bumpers and wooden stakes sides, so you can rest assured that your child is safe when using this walker. What's Great About It: We like this Classic Walker because it’s an excellent tool for building a toddler’s confidence in walking and running. You can also place a few toys in it to encourage them to walk with it. Size matters in choosing wagons for kids because it determines its capacity. But if you’re worried about storage space and transportation of monster-sized wagons, then this EasyGoWagon wagon is a better choice. You can easily fold the wagon so that it can be stored in tight spaces, such as in the trunk or in the garage. Your kids, on the other hand, will like it because of its all-terrain use, thanks to the heavy-duty wheels, large seating space, and storage basket. What's Great About It: We like that it’s one of the few foldable wagons available, a godsend to parents concerned about space. 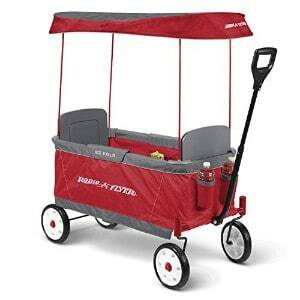 The overall light weight of the wagon is a plus too, while the washable basket and canopy makes it a joy for parents. You can store the wagon cover and canopy inside the mesh pocket. Radio Flyer is also known for its non-wagon products including the 4-in-1 Trike. This isn’t a wagon per se, but it has several uses that make it similar to a classic wagon. You have the benefit of a classic wagon as well as three other kid-friendly vehicles – a stroller for babies, a push trike for toddlers, and a steering trike for older kids. Since it has a 49 pound capacity, it also grows with your baby, so to speak. You’re getting great value for your money since your child can use it for a few years. What's Great About It: We like that it has multiple uses, and two kids of different ages can use it with just a few modifications. But even if you just have one child, it will be a great tool in their physical and mental development at different phases. As a toddler, the stroller is a great way of exploring their environment while you push them in it. As a preschooler, they can use it for exploring their surroundings on their own. Your child will be developing their physical coordination, balance, and strength in this manner. Again, the classic design of the Lil’ Wagon makes it a standout amidst the more complicated wagons on the market. The thick solid plastic body is sturdy enough to withstand all-terrain use yet light enough to be pulled by a child. The wheels are large enough to maintain your child's balance in rough terrain yet smooth enough for indoor use, especially on tile floors. Plus, your child will love pulling along their favorite things in it. The deep well and flatbed design allows for transporting both people and objects, such as your child's favorite toys. What's Great About It: We like that its dimensions are just right for smaller kids who want their own wagons to pull around and ride in. You will find your child loving the activity and developing their psychomotor skills in the process. Your sense of nostalgia may even come to the forefront because it looks just like your own childhood wagon. 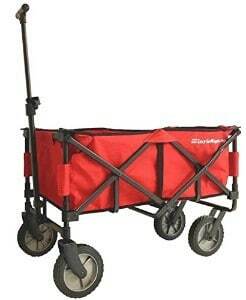 Radio Flyer certainly knows and meets the needs of its target market with the Ultimate EZ wagon. These have several practical features that make its price well worth every cent. Two children can ride in the wagon, or they can pull it along when it’s loaded with their treasures. You will like its collapsible body and carrying handle, which allows for easy transportation and storage, as well as the bottle holders. Your child, in contrast, will love its telescopic pulling handle, comfortable contoured seats, and high back rests, ensuring a comfortable ride in their wagon. This awesome wagon also has seatbelts. With kids, you should never be complacent about their safety while riding a wagon, and strapping them in ensures that they won't fall out or go wondering off. What's Great About It: We consider the collapsible body as the first selling point for parents, especially when there are other baby furniture items in the car. You will also appreciate the ease of cleaning, storage areas, and light weight. 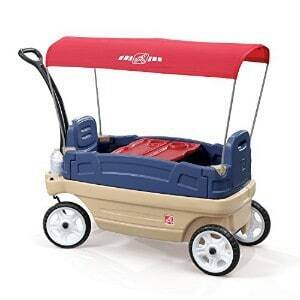 Most parents have their own memories about their childhood wagons offering endless outdoor fun. They'll likely have opinions about the wagons that their children will use. Of course, your child’s age and preferences should also be considered in making the final choice. We chose our top 12 wagon picks by carefully considering several factors affecting their physical appearance, safety aspects, and convenient features. We also read consumer reviews of the products we included on our list to ensure that you have top quality options. First, the physical appearance of the wagon, including its overall dimensions such as height, weight and length, as well as the colors, and decorations should be striking. The wagon should be spacious enough to accommodate the specified number of riders. Second, safety features should be present. Since kids ranging in age from 9 months to 8 years will be using the wagons, safety is always the foremost concern. We looked for sturdy materials and construction to ensure reliability, large wheels for stability, and seat belts. Third, the convenience-related features are a must for both kids and adults. We looked into spacious storage compartments, carrying and pulling handles, foldable designs, and washable materials. We checked and double-checked to ensure that every single wagon on our list meets the safety standards that parents want in their kids’ furniture. We know the importance of choosing the best possible ride-on and pull-along toys for kids for their physical and mental development. 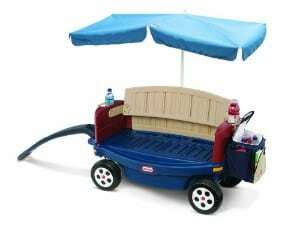 When you buy a wagon for your child, you’re not just adopting a herd mentality. You are, in fact, contributing to the development of your child’s physical, mental and social skills. You are then making a wise investment in their overall well-being, an investment with returns in the form a happier and healthier child. In terms of physical development, children who pull wagons improve their muscle strength and tone, which contributes to their overall cardiovascular endurance. The act of placing various objects into and removing them from the wagon also contributes to their muscle development. Just pulling the wagon itself can be considered as a kid-friendly exercise, a far cry from playing video games all day. They also develop their muscle coordination and core balance since a stable stance is a must when pulling a wagon. Even the act of getting on and off the wagon requires keeping their balance. Their mental well-being is also being developed while children play with their wagons. Their ability to recognize large and small objects, as well as to organize them inside the wagon, improves. Their communication skills also improve since they will have to communicate about the items in their wagons and to give directions for pulling. Suffice it to say that by exploring their surroundings with their treasure-filled wagons, kids develop character. They learn about choosing which items are valuable and which aren’t, as well as which things are theirs and which aren’t. Their social skills can significantly improve too. When kids play with one another, they learn to communicate and cooperate with each other to achieve their common goals. They learn to share their things too. Even if you don’t know these things, you can just look back at your childhood days and remember the joys you experienced with your wagon. You probably remember that you developed your physical, mental and social skills without even knowing it. You only realized it afterwards. But even if you didn’t have a wagon in your childhood days, you will still appreciate the benefits that these wagons can give your child. You just have to see the happiness on your children’s faces to realize that, indeed, these are excellent toys in comparison with video games.